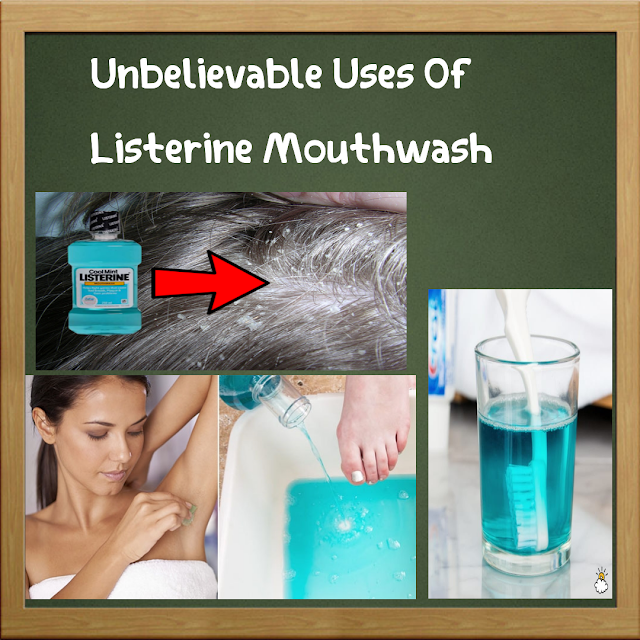 Mix Listerine with water and fill it into a spray bottle. Spray it on TV or PC screens to get rid of those unwanted gunk and stains. Just dab a small amount of Listerine on cotton and apply it to the directly-affected areas and you will start noticing the difference soon. If you are stung by a bee or any other if you are in pain due to any other sting then pour some Listerine on a cotton swab and put it over the bite to get rid of pain instantly. If you ate out of deodorant and can't get a new one immediately then just make use of the Listerine in your closet. Dab a cotton with Listerine and rub it on your underarms and you will be amazed at the results. You know Listerine kills the germs in the mouth ,similarly, dip the toothbrush in a Listerine water solution for few minutes and make it germ free. Add some Listerine to lukewarm water and soak the feet in it for few minutes.This will help to get rid of the sweat and stink and leave behind soft feet. Spray some Listerine on to the air to keep away bugs and flies.This will also act as a mild room freshner. Add a cup of Listerine to water,rinse off your hair with it to remove dandruff. If you have a itchy feeling after shave, just apply some Listerine to get rid of it. Dab cotton with Listerine and place it on the paining gum . This will numb the area and reduce the pain.